This week I thought I'd spotlight the book that was my reading muse for the month of April. Normally I read a few books a month but April was the wrap up month for my work in progress so I didn't get a chance to read as much as I normally do. It wasn't easy disciplining myself to write and edit instead of read this book. 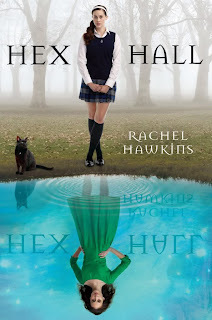 Rachel Hawkins pulls off a unique twist on the whole magic school idea, so unique in fact that I had trouble putting the book down. All manner of creatures are present in this unconventional tale of magic, secrets, and surprises. Some of the twists will keep you guessing until the very end. The main character and even supporting characters pulled me in from the very first page. I enjoyed Hex Hall so much that I'm eagerly looking forward to the sequel! I keep seeing this book pop up in blog reviews and I think I might just have to get my hands on it! I agree with Lisa. I'm seeing this everywhere, I think I have to get a copy. I remember seeing this book and wanting to read it, but I think there were some bad reviews that scared me off. Your review has given me courage, though, and I'm determined to read it now! I tried my best to win a copy, but no such luck. :) Love the new look of your blog btw! Sounds interesting. Maybe I'll have to check it out. Thanks! *looks around* I see you've spruced the place up for warmer weather. lol. Also, I have seen this book recommended on so many blogs. I guess I'll have to get it from the library and try to read it this weekend. Thanks for the review. I like books with twists!!! Despite some clique themes Hex Hall pleasantly surprised me. The character develepment is good and the twists are great. I think you ladies will like it. Kari & Molly, oh you noticed that eh? *does a twirl to give you a good look*. I'll be blogging about the change later this week!